In the wee hours of the morning, July 14, 2014, I was awoken by Thane ramming his body hard against the back of his crate which had the impact of vibrating my bed to wake me. My first thought was that he might still not be feeling too well from the impacts of the heatwave, but this seemed out of character for him. He had NEVER done anything like this before. He meant business and I could tell he was unsettled. I quickly got out of bed, let him out of his crate, and as soon as I did he tore for the front door. After checking the back patio door which overlooks the parking lot, I ascertained there was a big problem indeed. There was a maze of flashing emergency lights out front, more than had ever been here for previous individual tenant needs. I raced to the front door where I smelled smoke. I have no idea how bad the smoke was because I seem to have a greater ability to ascertain certain types of smells and where they are coming from. It isn't the heightened sense of someone with MCS (Multiple Chemical Sensitivities) but it is a sense I can use to assist me in life more so than my blind friends seem to have. Perhaps it was heightened at this moment because for so many years this sense was used to protect me from danger. I harnessed Thane with the essentials I could not do without to navigate, and headed out the door still in my pjs (not even thinking about that little detail). The building wide fire alarm was blaring, but I was not privy to that as a deafblind tenant. Thane has always been sound sensitive to our fire alarm (not to be confused with the simple smoke detectors in most apartments and homes that can be shut off once you are alerted to them). This time, he was all business, doing what needed to be done to save me/ us. I had a really difficult time getting through the two fire doors that blocked passage to the only outside doors that have wheelchair accessibility. Once I got to the final door which led to the outside, a really nice gal held it open so we could get through it more easily than our normal approach. She was trying to talk to me, but I could not understand her. I explained that I was deafblind. Immediately she began to fingerspell when she heard the word deaf, but I could not read her signing. I explained to her that I needed to feel her hand to understand what she was signing. She was awesome and helped me understand what was going on. She even knew one of my friends here and took us to where she was after I got wet by the grounds sprinklers going off. Being with my friend helped both Thane and I relax. The sprinkler system did its job with the fire in the unit one floor up and directly across the narrow hallway from me. The water damage from the sprinklers is being dealt with for both of the two units and the hallways-- lots of work ahead with that, but the bottom line is that everyone was OK. I am just so impressed with Thane's work. We've never had a situation where I needed him more than I did while I was sleeping that night. Something changed in us after this experience. I realized just how much my wonderful sidekick will do for me when danger is knocking at my door. We are both OK, albeit a bit rattled from the experience that first day. When the firemen were leaving the apartment across the hall from me, I had the opportunity to speak to them about my safety concerns in an emergency. Thane definitely proved himself in this situation, but I just have felt it important to have a safety net with emergency response teams knowing to check that I made it out. My address is being flagged so emergency personnel will always check. In other places I have lived, there isn't a very high turnover of tenants, but here, I have been here longer than anyone in my wing on this floor so relying upon a neighbor in an emergency wasn't the answer. I'm grateful for the firemen's ability to input my address to give me an extra sense of security. It is my hope that we will never experience another such experience again. I plan on putting together a good go bag so that if there is an emergency to contend with again, I am ready to get out the door more quickly. One can never be too prepared. The memory I am taking away from this experience is just how much Thane ROCKED! He is my HERO! Recently freedom has become one of the most amazing words in the English language for us. 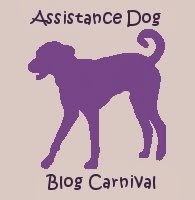 When I saw the topic for the upcoming Fifteenth ADBC (Assistance Dog Blog Carnival) being hosted by Gentle Wit was *Freedom*, I knew I had to make the time in this new life of ours to participate. If you had asked me 6-8 months ago to write on this topic, I probably would have written about the independence and safety I feel as I work with Thane and trust in his judgement around drivers whose minds are on everything, but the 2,000 plus pounds of steel they are steering into the crosswalk we are travelling across. Today, though my definition of FREEDOM is very different. For the past six months I have been embarking on a scary, albeit remarkably rewarding journey. Through a program centered in the science of neuroplasticity, I have left the life of isolation I lived for fifteen plus years behind me. It was not a CHOICE to live that way, but a necessity (or so it had always been thought). Brain damage to my limbic system had left me with profound Multiple Chemical Sensitivities and Electro-Magnetic Frequency Sensitivity. Though I am still a work in progress, the changes in our life (not just related to MCS) have been dramatic to say the least. Living life without the limbic system locked in its flight/ fright response is truly incredible (and relaxing). There have OBVIOUSLY been a lot of new experiences for the two of us. When I trained Thane, it was in a very limited scope for public access with the rest being in home tasks for my multiple disability needs. When it came to public access, we essentially went grocery shopping, picked up meds at an outside pharmacy window, used transportation, and went to vets and doctors when required. The rest of our life has been spent mostly in the home environment or taking walks in areas where it was safe enough with my respiratory mask (which I could never go outside without leading to oxygen deprivation issues when I wore it very long). In the past six months, I have not only been training my brain to rewire and thus correct the dysfunction, but I have also been dealing with whether these changes for me would mean it was time to part ways with Thane as my guide or whether fighting harder for his thyroid health would have any better results than they had for his predecessor and thus allow us to pursue this new life together (at least for a time). It does seem like the latter is coming to pass which is quite exciting! Training Thane to handle new experiences almost as though he were a young pup being socialized to everything he might encounter as a trained service dog might seem odd to some given his age, but its wonderful to be taking this journey full circle with him. Through this we've discovered an older dog (7 years old) DEFINITELY can learn new tricks as we experience new joy in training and being in public places that we never could have been before. As I continue to heal and rewire my brain, I find this intense joy in nature and outdoor opportunities. If it wasn't for my power wheelchair, I'd probably hit the trails, never looking back again. giggle I suspect this intense nature drive stems from how much time I've been required to stay indoors so isolated from opportunities. As Thane continues to heal, I am finally experiencing the guide dog I had always dreamed of having at my side-- the dog I knew he could be and this is INCREDIBLE as it shows me that the new life I am embarking upon is going to be a new life with him showing me the way. I have a long way to come socially, but today I find great pleasure and yes, freedom in the little things of life. The freedoms I am / will be able to experience now with Thane guiding my way through new terrain and opportunities is what it means to truly live freely to me. We are no longer merely existing through life each day, but experiencing life through a guide's eyes filled with curiosity and alerts that describe intricate details about this new exploration I am embarking upon. The year was 2007, I had just lost my first combo trained service dog two months prior. Here I was in eager anticipation readying my home for a beautiful red and white smooth coat Border Collie boy to grace me with his presence. This is the day when I was able to allow my heart to begin to heal as I rejoined that circle of training again which led to my wonderful, albeit challenging, partnership with Thane. Here I am 6 years later. We learn lessons from every partnership we have, but I think that the lesson of most impact for me today is that you can never predict the future accurately. You can learn from the past in order to prevent future similarities, but you can't know what tomorrow will bring for sure. I thought I would list some of the lessons I have learned through my training and partnership with Thane. I won't be listing them all, as I would be here typing a very long time to do that. The lessons shaped our future are important though. I can not nor should I mold this dog into a carbon replica of Met. Thane is his own self; a very different dog and I need to let him work in his style. Backchaining a task can lead to much greater reliability than if a dog just learns the task by example watching another dog or with fine tuning a behavior offered. A less *natural* dog can test one's training abilities. The successes also are that much more exciting when the breakthroughs happen. When a dog begins having symptoms that encompass many systems of the body, treating symptoms is not going to be life affirming. One needs to get to the bottom of things quickly with a knowledgeable Veterinarian. Ticks can be diseased wherever you are in the world. You do not have to live in Massachusetts to develop Lyme disease from a single tick. Treat the individual, not the lab reports, otherwise a partnership may be sidelined (even lost completely). Similarities in health issues at the onset, do not have to mean the same result over the long haul. Healing myself can result in a much healthier, more focused connection between dog and handler. How I deal with situations in life has a direct impact on the pull into harness that my dog presents with-- relax and enjoy yourself! Today I have found great joy in taking really long hikes through various areas we can access directly or via the public transit system. I love having a dog that enjoys these adventures as much as I do. I don't know what the future holds for Thane and I-- where we go from here is anyone's guess. What I do know is that by being partnered with my challenging redhead, has made me have to become a better trainer and handler than I had to be with my first dog. I love that about this partnership, but most of all, I just love Thane's ability when we get lost, to make us found again so easily. It's like anywhere we go, he just has this extra sense about the surroundings that I will never have. So today, we celebrate the six years of life, both the good and the not so good, because when you put all these events together, they present with a partnership that has had to grow and learn hard lessons to be who we have become. I wasn't going to do this round of the Assistance Dog Blog Carnival (ADBC) because recently my life has been a full time job, and then some-- but I think the lessons I am learning in my partnership are also just as important. When I saw the topic for the carnival is Lessons, I could not pass this up. For the past month, I have been working with a program to recover my health (and it is happening). In the process of this, I have been taught some interesting, unexpected lessons about how I work/ed with Thane and the inadvertent teachings that my avoidance behaviors have conveyed to him. I always knew that Thane was one who really was connected to my emotions. More times than not, if I was having difficulty in working him, all I had to do was check in with myself and know where the problem lay. He taught me to really relax and stay in the moment, which I felt to be a very good thing for the entire partnership. He would not have made a very good candidate for an individual recovering from the traumas of war or other PTSD impacts, but for me, with less impacts in that area, he has been a great teacher. So, I thought we had this all figured out! I mean, I was relaxed thanks to him and thus we worked great-- right? One of the first benefits of the program was the development of a calm and relaxed person who was able to live in the moment more. Once this began setting in, I could not even wrap my head around how tightly I had been wound for so many years. As I relaxed (and I mean, truly relaxed), the partner at my side transformed into someone I did not even recognize. We were just getting started at that point. I pondered what other lessons were in store for me/ for us as the program progressed. The next realization wasn't such a good one. I discovered that there were unintentional teachings going on due to my need for avoidance of heavy exposure. The result of this teaching was that I had inadvertently taught Thane that in all high fragrant environments, we must high-tail it out of there at the fastest possible speed. While I was living it and experiencing the impacts of the exposures, I could not see that the quick exits I make in living this very isolated life, albeit necessary ones, were inadvertently training Thane that any place there was high fragrance, we were to behave as though we were jumping out of the starting gates at the Kentucky Derby! Needless to say, part of our work now entails some serious retraining to slow down and move along at a more normal speed. This isn't just retraining for Thane, but for me as well. I have had a strong aversion to crowds and have avoided them for much of our partnership by shopping only in the morning hours. As I have regular *homework* with the program I am doing that must be performed a few times a day, it means to get out early would require getting up at an unspeakable hour. Needless to say, Thane and I are getting our exposure to situations where we must work at a more natural pace (to others). It's definitely giving us more training opportunities where we can succeed together as a team in earning the jackpot. There is still a time and a place for our enjoyment of higher speed working, but right now it is a matter of using my common sense to teach him which places we should work more slowly and which ones we can cut loose and enjoy the wind blowing through our hair. There is so much more than the unintentional training that is being addressed right now. Part of Thane's training/ work has been in the area of medical alert to very specific triggers I have/ had. In the process of the program I am doing, some of these triggers have either improved or gone away. As a result, the alerts for them are either not as critical or not necessary at all. For those who have never been around a Border Collie on a regular basis, it can be quite challenging to undo training. I've learned through experience that accidentally clicking in training when the dog lets out a woof (Met) as it closes the door can be much harder to extinguish than it may seem. In Thane's case, I have had progression of my blindness and have had to work very hard to extinguish simpler approaches to awkward curbcuts or turns with awkward placements of sidewalks in retraining him to do what may seem inconvenient, but conveys more to me about my position/ location. Now it seems, just as changes to his guide training were necessary, so are changes to his alert training, by using the alerts he provides in different ways-- essentially backchaining the unnecessary ones out of his repertoire as I progress for the better. I will say that the one part of all of this that I/we am/are really enjoying is exposing him (and me) to new situations. Sometimes it is easy to transfer training from other situations to the new environment or experience and other times, it is completely new training. This is a really fun part of the program-- getting to experience new things/ environments with my sidekick. Six years ago today, I took Met over to my folks place to give him his final yard time before saying farewell and sending him off to the bridge with the help of the vet who had worked with us since we left California. Thane and I headed to our former haunts, but before we could really enjoy the day I had to deal with all the USPS online hiccups. This was not happening! I kept telling myself first yahoogroups, now USPS- what is next! We did not get out of here until close to 11AM on a day with temps to hit high 80's to low 90's. By the time we did the errands we needed, it was just too hot for Thane to enjoy himself. Note to self- do not combine Met's anniversary with final section 8 re-cert needs again. There were however HUGE reminders of problem home owners/ renters when it came to sidewalk access. It made it difficult to think about why we were there today. After we were home for a while and I had enough time to feel rested from the trip, it dawned on me why it seemed so typical of any other day. It is because I have truly moved on. Off to play with Mr. Awesome! It seems that yahoogroups is deciding to take a go-around at making things worse for people with disabilities- following googles run of the same not too long ago. Yahoogroups has changed things so that there are no settings controls that you can change. They have removed the simple non-graphic banners with this horrible mixture of neon colors that makes me so sick, I have to run for the bathroom. It messes with me in a vertigo way as well as sending me into seizures. There is NO WAY to block their banners as they are not done like ads, but are a part of the script that can not be blocked. The bottomline is that my list will be closed. It's a sad thing for me despite the inactivity since my move. I guess this bothers me so much because yahoogroups is the cause of this. The only other option would be to move the list to another server, but there are not very many servers out there and most are not worth considering. Though for lists I am a member of, I could use digest format, the list I own requires I access the website for management reasons. As a result of this issue, the only salvation for the list will be if one of the list members comes forward agreeing to take over the list.